Last week, we wrote a blog post about way-back-when Christmas in Australia’s historical moments defined how Aussies celebrate the latter part of December. Now onto the second and final part of memory lane, it’s good to know how tradition has served the country well during gift giving season. Dating back to mid 19th century Britain, he says, Queen Victoria (or rather her husband, Prince Albert) seemed responsible for introducing the Christmas tree. This was in England in the 1840’s, yet the tradition was of German custom. Maybe you didn’t know this but at this same time, Christmas cards were also introduced. The overall focus was on family values, sentimentality and childhood. Obviously Christmas existed way before then but was usually celebrated in church by way of sermons. Only until the 19th century did it become a public holiday and a family occasion outside of the church. So even though the Aussies were greatly influenced by this British Christmas soiree, new Aussie locals decided to add a different flavour…literally. Around the 1950’s Aussies gave out Christmas cards with Santa pulled by a kangaroo instead and then headed to the bush, cutting down big swags of leaves (usually eucalyptus), tying them around the house. Ham and cockatoo pie swiftly became the norm, as a staple alternative to the great British Christmas meal. Another long term custom included bringing local flora and eating local fauna. Having an outdoor Christmas in the summery December, over the past century, is standard and the Aussies believe that it’s a ‘golden summer,’ with many of their heritage British traditions simply being tweaked to accommodate the climate and natural resources. This year, if you’re celebrating Christmas in Sydney, not only do we encourage you to head to the beach and spend the 25th making snowmen sandcastles, but also enjoy some healthy Vitamin D on your skin while you sit back on our veranda overlooking Cremorne Point, and chomp on that ham & cockatoo pie. You’ll enjoy a holiday season that’s upside down, back to front and now reading this…it absolutely makes sense. 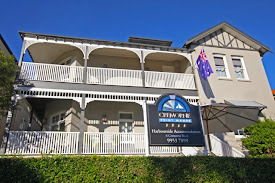 What a wonderful way to spend the holiday with us at Cremorne Point Manor!